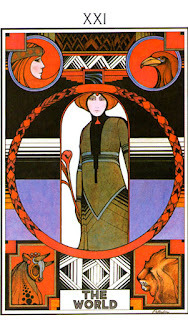 Anyway, yes, the World - a card of success and completion and fulfillment, journeys coming to an end. A lot of decks tend to hew to the same basic concept illustrated in both RWS and TdM, though with their own various takes on it. In general, its not a card I have many qualms with in most decks, though also...rarely a favorite. Of all the many deck-variations on the traditional image of the woman inside the large wreath of accomplishment, I've long been very much partial to this one. I love the dynamic, sensual energy of it: the woman here isn't just standing there, but rather, seems to be dancing, celebrating. The feeling of acceptance, of confidence, of completions, success - all of that seems to be here, much more so than in other cards with similar imagery. Looking at this card, I can feel the meaning it is supposed to be representing. Of course, the lovely use of color here certainly doesn't hurt. As my previous posts in this series probably have already made clear, I am very much a color-oriented person. The use of the yellow-gold as a background here works really well especially. Love the details in the wreath, the animals, and of course those pillars which surround all of the majors in this deck. Stained glass effect works wonderfully here. As for these two, I couldn't quite decide between them because...they are so very DIFFERENT, and yet, both have aspects to them I really like. 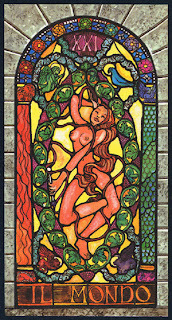 For the Aquarian World card - well, it definitely does not have the kind of wild, dynamic energy I see in the other two, but makes up for that with...well, I must admit, I have long been very much a fan of art-nouveau and art-deco, and the application of those to this card, done so thoroughly, with such lovely thematic consistency and attention to detail...I just love it. The color scheme is lovely too - not one you see very often, but more striking because of it. I particularly enjoy how it has all the basic aspects of the RWS but...re-done, re-imagined, stylized so nicely. 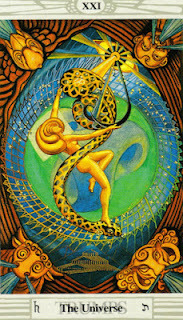 As for the Thoth...I've written about this World card before, more than once. I really do love it. 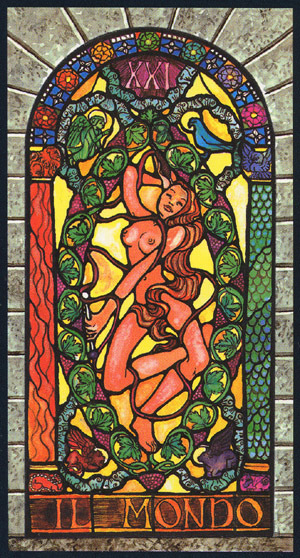 Naked woman of gold dancing with a snake and all that it can represent - oroboros, beginnings and ends; she is dynamic, the universe opening up quite literally behind her, intimate and public all at once. Stars, the outline of ancient structures...and that, all of that, is only the surface level of the card, my own intuition - how much more to read about, dig deeper in the other layers that the Thoth deck has to offer...yes, a worthwhile take indeed. The Aquarian is really striking in a more serious, almost stern way. I need to pick that deck out soon, it is so lovely! I loved reading this serie of posts, thought of completing my own but I got stuck on the Emperor lol.